The ultrasonic-assisted bone instrument from Söring was developed specifically for the resection of bone and offers numerous advantages in spinal surgery, e. g. for decompression procedures. The non-rotating technology allows a very precise and fine approach, so that the surgeon can work closely to critical spinal neurovascular structures such as the dura mater. Additional pressure is avoided, which is extremely important when working in already tight spaces. Due to the longitudinal movement of the sonotrode tip there is also no risk of "grabbing". Another great advantage compared to other instruments is that bone can be removed in individual pieces, as it is not ground. Thus, removed material can be used further for fusion operations. 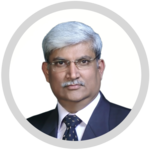 Thereby artificial bone material or bone graft harvesting can be avoided. The surgeon can choose between two sonotrode shapes and lengths and optimize the instrument regarding indication, procedure and access route. 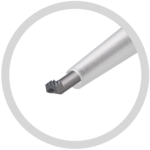 The blade shaped sonotrode cuts out vital bone pieces precisely and with a straight cut surface, so that they can be reused. The rasp shaped sonotrode is used for precise bone ablation.